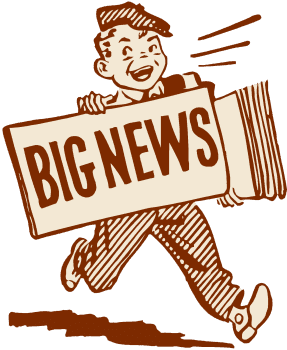 Chiropractors which have acquired professional training to work with pregnant women commonly utilize special chiropractic tables that adjust to a woman’s pregnant body. They are also trained to utilize treatment methods and techniques which avoid the use of unnecessary pressure on the abdomen. In addition, a doctor of chiropractic will provide the patient with the most appropriate set of stretches and exercises that are safe to perform during pregnancy. Throughout the pregnancy process, a woman’s body will undergo a variety of physiological and endocrinological changes in preparation for creating the best environment for the development of the baby. Furthermore, the body will have to adjust to its new body mechanics, especially the normal structure and function of the spine. Several pregnancy body changes include: a protruding abdomen; increased back curve; pelvic alterations; and postural adaptations. These new adjustments can challenge the structure and function of the body, to the point that a misalignment of the spine of other joints as well as the irritation and inflammation of the tissues can occur. Ultimately, restoring the original alignment of the spine and the balance of the pelvis in relation to the rest of the body is one of the main reasons why chiropractic care is essential throughout a woman’s pregnancy. A misalignment of the spine or pelvis, also known as a subluxation, can reduce the amount of room available for the proper development of the baby. This restriction is medically referred to as an intrauterine constraint. Also, the misalignment of these specific structures can make it difficult for the baby to get into the best possible position for delivery, affecting the mother’s ability to have a natural, non-invasive birth. Breech and posterior positions can interfere with the ease of labor, leading to the use of other medical interventions, such as c-sections. Maintaining the spine’s natural alignment helps the entire body function effectively. Because the nervous system is the master communication system between the brain and the rest of the body, including the reproductive system, ensuring the connection between these is not interfered by a subluxation is fundamental to guarantee the well-being of the individual. Chiropractic during pregnancy can provide a substantial amount of benefits for pregnant women. These benefits include: maintaining overall health and wellness throughout pregnancy; helps control symptoms of nausea; reduces labor and delivery time, relieved neck, back and joint pain; and it can help prevent a potential cesarean delivery. As the amount of women who seek to take advantage of the benefits chiropractic care can offer throughout their pregnancy increases, more healthcare providers have begun to seek the services of doctors of chiropractic who specialize in the treatment of pregnant women. When considering chiropractic to maintain overall health and wellness during pregnancy, or when searching for an alternative treatment option for an injury or condition while pregnant, make sure to discuss these options with your healthcare provider. Chiropractic care should not be utilized as a sole source of treatment and maintenance during pregnancy, however, chiropractic can be used in collaboration with other medical services to ensure the patient receives the best care throughout their pregnancy. Aside from chiropractic care, there are other treatment methods and techniques which can also benefit women throughout their pregnancy. Many individuals use kinesio tape, also known as elastic therapeutic tape, an elastic cotton strip with an acrylic adhesive that comes in a variety of colors. 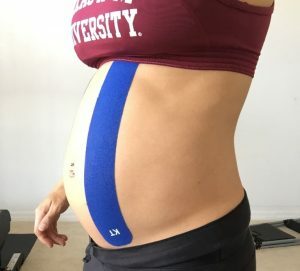 Kinesio tape is generally utilized in athletes to treat a variety of injuries or conditions, however, applying the elastic therapeutic tape on pregnant women can help relieve many pregnancy discomforts, providing other great benefits. The elastic therapeutic tape, or kinesio tape, functions by treating as well as helping to recover from and prevent injuries. With its acrylic adhesive, it serves to lift the skin and promote better blood circulation. Used universally today by the growing population, kinesio tape has even been utilized by the elderly to treat normal home injuries. Apart from treating injuries, elastic therapeutic tape can help stabilize and correct posture. When it’s applied properly by a professional, the natural elasticity of the tape will gently lift the skin to help relieve pressure from pain receptors. Once it’s applied, the individual’s circulation will improve, working immediately and continuing to provide relief 24/7 for approximately 3 to 5 days per application. In addition, kinesio taping helps ease the body’s natural healing process, allowing for the individual’s original range of motion to improve by also providing stability and support to the surrounding muscles, joints and other tissues, as well as reducing pain and discomfort, swelling and controlling inflammation as a result of the improved blood flow. A variety of benefits kinesio tape can offer include: prevention of injury; treatment and rehabilitation; promotes blood circulation; posture correction; optimized performance; near immediate treatment; stays on up to 3 to 5 days throughout treatment; able to shower and sleep with it for continuous relief; no heavy bracing; and it offers no restrictions due to its elasticity. 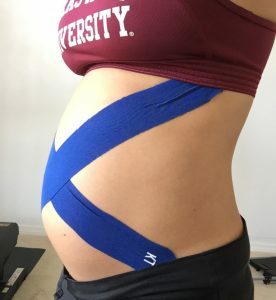 During pregnancy, the use of elastic therapeutic tape can be a safe and effective treatment option for pregnancy discomfort as well as for other types of injuries and conditions. Low back pain and pelvic pain can be common issues that affect pregnant women. 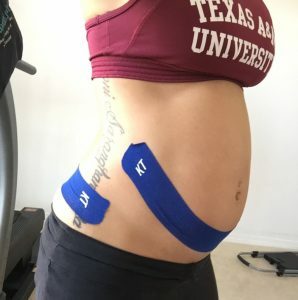 Kinesio tape is a drug-free alternative, similar to chiropractic care, that can offer pregnant women additional relief from the well-known symptoms which develop during pregnancy, including back pain, swollen feet, sciatica, and carpal tunnel, among others. 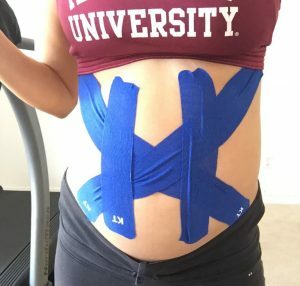 Because of this, elastic therapeutic taping can be one of the most ideal options for expecting mothers who seek natural relief from the common symptoms associated with pregnancy. 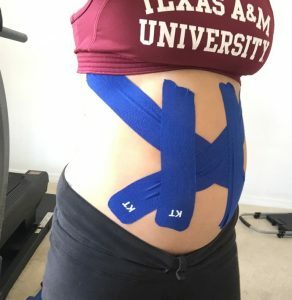 Kinesio tape can also function similarly to a support belt or belly band, with the proper placement of the colorful tape to either the back or abdomen. 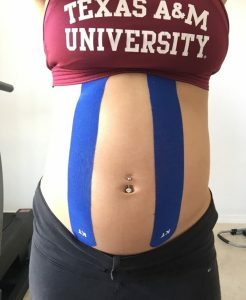 The most frequent postural pain and discomfort pregnant women experience can be relieved using the kinesio tape in this manner as it will help distribute the weight of the additional pounds. It can also greatly reduce fatigue as well. In comparison to purchasing support belts and belly bands, elastic therapeutic tape can be considerably more economic in the long run. For most pregnant women, symptoms of pain and discomfort while pregnant can make sleeping difficult. Nonetheless, because these tapes can be worn while sleeping, they can provide continuous relief and a much needed rest. Many healthcare professionals are trained to apply elastic therapeutic tape, however, one can learn to apply them themselves. Using kinesio tape can be challenging and difficult to apply at first. It’s important to allow a primary care physician, chiropractor or other healthcare specialist to demonstrate the proper way to apply kinesio tape before attempting to apply it yourself. Some elastic therapeutic tape may need to be altered before being applied to achieve a specific function. Always make sure the skin is dry and clean before applying the tape to ensure it lasts longer. To remove the tape, use baby oil on the strips to gently loosen the adhesions. This first technique functions by lifting the lower belly to help relieve painful symptoms as a result of the increased amount of pressure being placed onto the pelvic flooring. Begin by attaching one strip of tape firmly at the middle of the lower belly. Then, follow by pulling both sides of the tape upward to lift the belly, attaching the ends securely. If you need to apply more strips, repeat the process using a second strip and check how it feels for you. 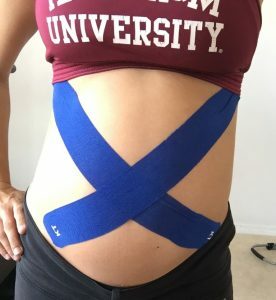 This technique is excellent for providing frontal support for pregnant women. Using two strips of kinesio tape, attach the ends firmly at the bottom, pulling each strip upwards and securing them under the breasts. Women with smaller and/or shorter torsos can cut the elastic therapeutic tapes in half and follow the same application process. This technique can be significantly helpful for pregnant women whose bellies are protruding outwards quite a bit. 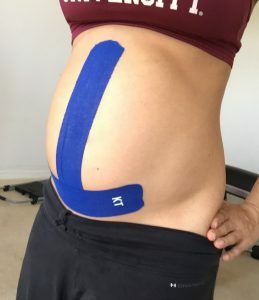 Using two strips of kinesio tape, you are going to form an “X” at your belly button, beginning from the bottom, just above the hip bones. While pulling the tape across the belly, make sure to pull firmly in order for the tape to hold your belly in place securely. This fourth technique is for pregnant women who experience full belly pain. If you have lower back pain as well as belly pain, you can combine this technique with the following technique (see next technique). 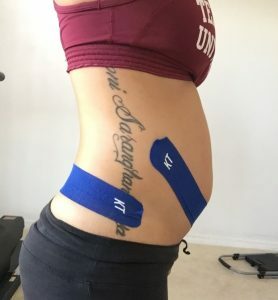 Using 4 strips of elastic therapeutic tape, beginning at one hip, apply the tape and pull it diagonally across your belly button up to the opposite ribcage. With a second strip, follow the same procedure as before on the opposite side. Next, take a strip of kinesio tape and apply it from the bottom, up on each side of the navel. Make sure to firmly attach the elastic therapeutic tape at the bottom and then pull upwards to anchor it at the top above the diaphragm. The next technique is perfect for pregnant women who’ve only experienced discomfort in the front and lower abdominal regions. Utilizing two strips of elastic therapeutic tape, with the first strip, begin by applying it at the pubic line then pull upward, attaching the end of the tape right under the diaphragm. With the second strip, begin by applying it at one end of the lower belly, above the pubic line, and stretch it across. With smaller women, it might be necessary to cut the strips in half and follow the same procedure. This final technique is considered fundamental for when the baby gets so big that they begin to push into the diaphragm and can make normal breathing difficult. For this procedure, only one strip of elastic therapeutic tape is necessary. Smaller pregnant women may have to cut the strip in half and follow the same procedure. Foremost, you will need to firmly attach and hold the strip at one end while pulling it across to the other side, focusing on pulling it downward. The point is to bring the top of the belly down to ease the diaphragm. 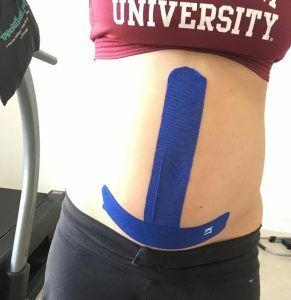 It’s important to consult your healthcare provider or chiropractor before attempting any of the following kinesio tape techniques by yourself to discuss whether kinesiology taping is appropriate for you. Furthermore, be sure to notify your healthcare practitioner if you have sensitive skin to ensure you do not react negatively from the tape adhesive. Once the kinesio tape is applied, a healthcare professional can provide careful instructions on how you can preserve the usefulness of the tape while showering, bathing and dressing. The above information is by no means a replacement to a consultation with a licensed healthcare provider. Consultation with a chiropractor or other healthcare provider is recommended for any individual suffering from symptoms due to an injury or condition. If you are not experienced with using elastic therapeutic tape, allow a medical doctor, chiropractor, physical therapist or other experienced healthcare provider to demonstrate how to properly apply the tape for use at home. Just as chiropractic treatment and various techniques using elastic therapeutic tape can benefit women throughout their pregnancy, massage can also be a helpful alternative to provide further relief to pregnant women. The goal of every pregnancy massage is to provide unique and special needs to expecting mothers. 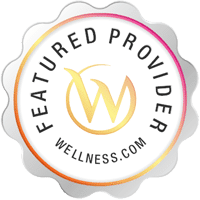 Certified pregnancy massage therapists are qualified and experienced to perform the specially designed massage techniques on women to help relieve the most common pregnancy symptoms, making sure to protect both mother and child during the massage. Pregnancy massage can differ greatly from others and it is often unique in its application. During the massage, the pregnant women is carefully supported using cushions and pillows to provide the expectant mother with superior comfort. This type of massage is above all very gentle and deep tissue techniques are never utilized as a safety precaution. In addition, many areas of the body are avoided to protect both mother and child, providing extra attention only to specific areas of the body which are particularly affected by pregnancy, such as the back and/or the feet. Regardless of these safety precautions, pregnancy massage is generally not advised during the first trimester. The gentle pregnancy massage can tremendously help both physical and emotional pain and discomfort in pregnant women and the psychological benefit of itself can be greatly therapeutic. In addition to stress and anxiety reduction, a pregnancy massage can help reduce common symptoms associated with pregnancy, such as swollen ankles and lower back pain. In conclusion, a woman’s overall health and wellness is fundamental throughout their pregnancy and alleviating painful symptoms along with those common discomforts associated with the stages of pregnancy can help provide comfort to expecting mothers. From chiropractic care and the application and use of elastic therapeutic tape to pregnancy massages, there are a variety of safe, efficient and beneficial alternative treatments and techniques that can help pregnant women throughout their pregnancy without the need of drugs. The above mentioned treatment options are natural alternative which have been considered by many women. If you are in need of relief or simply wish to enjoy the benefits of these procedures, make sure to discuss them with your healthcare provider before following through with these treatments.